Explore the world of the Maya in Mexico. We have over 35 years of travel experience in the Yucatan Peninsula's states of Yucatan, Campeche, Quintana Roo to help you design an educational tour to suit your interests! We specialize in archaeology and anthropology in concert with the natural history of the area. We design in-depth itineraries, customized just for private groups, schools, and organizations. Whether you are a travel agent, a tour leader, a high school or college teacher, a family or couple, we'll be very happy in assisting you create a memorable Mexico tour for you and your specific interests. 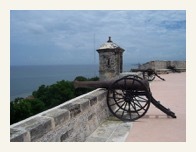 Below are some sample itineraries for exploring the Northern Yucatan Peninsula of Mexico. 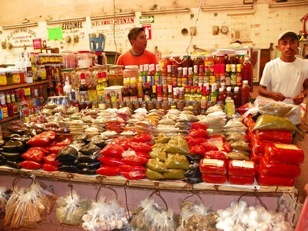 For a look at our latest unique tour in the Yucatan, please click here for our Yucatan Mexico Food Tour. While we want to introduce you to the wonderful highlights of the Yucatan Peninsula, we also want to allow you to experience many of the small wonders to be found there - at small archaeology sites, traditional Mayan towns and villages, beautiful nature areas, local restaurants and markets, and with interactions with local residents. This is achieved by traveling with expert local guides and thoughtful itineraries. 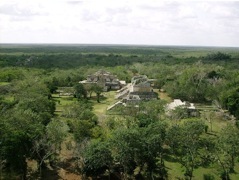 The Yucatan Peninsula, is called the Land of the Mayab. It is a region full of wonders - a fusion of the past and present. A great travel destination - it offers unique geography, a rich history, scenic environments with high biodiversity, delicious cuisine, quality accommodations, and friendly peoples. Upon being there, you will soon see why so many people from around the world have relocated to the Yucatan - warm climate, friendly residents, low crime rates, affordability, good infrastructure, beautiful scenery and sights, and of course - the fresh foods and cuisine. - Celestún Biosphere, a 146,000 acre Reserve with a combination of coastal scrub, estuary, and mangrove, which together provides an excellent habitat for a diversity of wildlife of many sorts - best known for its Flamingos, but is also host to over 300 other species of birds. 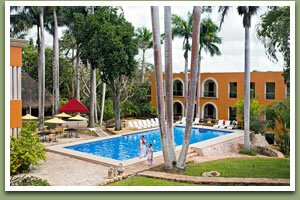 After your flight we will pick you up at the Airport and go to your hotel, the Hotel Caribe. The hotel is a three stars category and has a great location located in the downtown historic area. Hotel upgrades are available. We start early in the morning when we pick you up at your hotel, then we will drive straight to Celestún, which is around 2 hours from Mérida. During the excursion you will go on a boat tour along the “Ria” (sea inlet) where you may see pelicans, storks, egrets, ibis and other exotic birds like the Flamingoes. After the Celestun boat tour you will stop at a fresh water spring where you'll have the opportunity to have a refreshing swim in the crystal clear water. 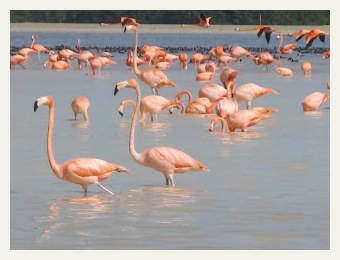 The Celestun tour comes to the end and we return to Mérida, the rest of the day is free for personal exploration. We recommend you to take the Turibus to get acquainted with the city and it is the perfect opportunity to see all the different restaurants and places to go at night. We are sure you will love this tour. It is an original way to experience firsthand the flavors and traditions in the Yucatecan Cuisine. 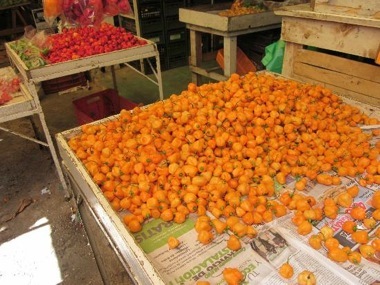 We first visit Merida’s main traditional market “Lucas de Gálvez” where we will buy the ingredients, while listening to our guide explanation of the local ingredients and traditions. Afterwards we will get a bus on our way to the local family house where we are cooking. All the menus are typical Yucatecan meals, made with family recipes. Once we have ate and chatted with our host we head back to centro. The rest of the day is free for siesta and exploration. 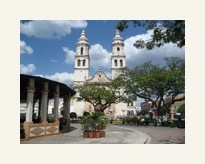 The excursion will start early in the morning when your guide picks you up at your hotel in Merida. 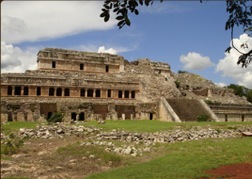 First we will visit Uxmal ruins, one of the most popular ancient mayan cities. 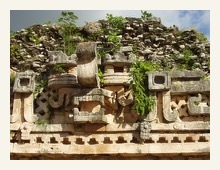 “Uxmal” in maya means “three times built”. 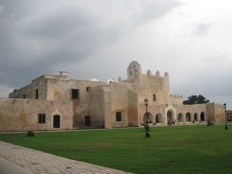 Here the guide will explain in depth the Puuc architect style of buildings such as the Nun's Quadrangle, the Ball court, the Turtle House and the Governor Palace. 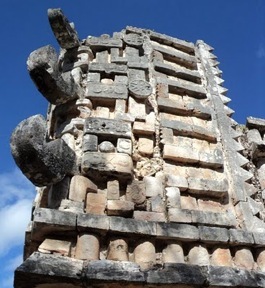 After Uxmal, you will explore the archeological site of Kabah, Mayan name wich means “lord of a strong hand”. 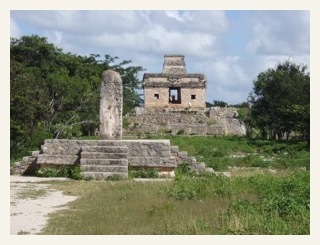 Kabah is linked to Uxmal by a “sacbeh" or white road used for ceremonial purpouses. Kabah is one of the stops of the Puuc Route and here you can find many structures with carved masks of the God Chaac, the important god of rain for the Mayans. 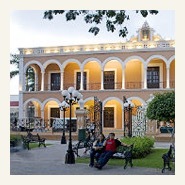 Your last stop before you return to Merida will be a restaurant for a delicious Yucatecan meal. Note: If you want to change Uxmal and Kabah for Chichen Itza it is possible. 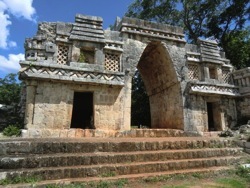 The Chichen Itza tour starts at your hotel at 9:00 am when we pick you up and drive to the site. Your guide will explain in depth about the beautiful architecture and the knowledge of the cosmos that the Mayan people had. We will learn about the "Sac beh" or white path that takes you to the Sacred Cenote where it is believed that the mayans offered sacrifices to Chaac, the god of wáter. After visiting Chichen Itza you will be taken to a restaurant to enjoy a buffet type lunch. Sometimes there are shows inside the restaurants to increase your enjoyment. These shows include the traditional dance called “Jarana”. On this Cuzama cenote tour from Merida you will have the opportunity to be on a jewel of nature hidden in the jungle, one of those places that mostly only locals know about. You will climb on a cart pulled by a horse over railroad tracks that take you to each of the beautiful cenotes. 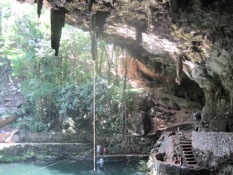 The main cenotes in Cuzama are Chelentún (lying rock), Chansinic'Ché (ant tree) and Bolón-Chohol (bat hole). Each cenote has its own attractive, making each one of them a different adventure that you can enjoy all in a day trip. Once there, you can swim in the crystal water, dive, hang from the roots of the trees that hang on the roof of the cenote, explore the underwater world of this magnificent cave. Then enjoy a delicious traditional Yucatecan lunch before we head back to Mérida. This is a free day for you to relax, personal explorations, or you may arrange an option day tour. If you are craving for something different to do, how about having an amazing Mayan experience and visit to a not so touristy place? A Mayan Biking Adventure is a wonderful day tour. 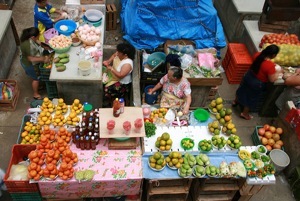 First we will take you to Tixcocob a little Mayan town outside Merida, where we will have a quick visit to the market. Then bike 6.8 miles to the archeological site of Aké, a tiny site with lots of history. 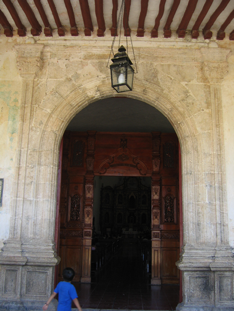 Afterwards we will visit the San Lorenzo de Aké Hacienda, where the henequen rope is still produced. 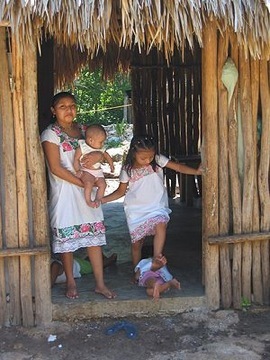 We will return to Tixcocob riding again and enjoy a truly Mayan family lunch (included in tour) with our Mayan host. After all that you will still have half a day free! This is a free day. 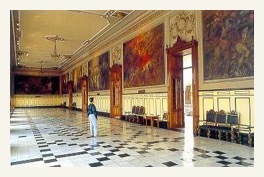 The transfer to the Merida airport is included. Day 1: Arrive Merida Welcome to Mexico! 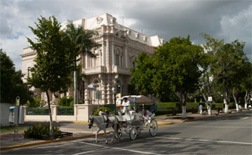 Upon arrival in Merida we are met by tour Tour Director and then transferred to our hotel. Day 2: Cuzama Cenotes We visit two marvelous Cenotes located in the small village of Cuzama. The cenotes are sinkholes where underground rivers break through the limestone crust of the earth. 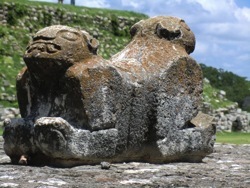 For Mayas, they represent the doorway to the spiritual underworld. 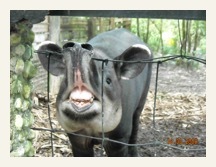 We'll get on horse-drawn trucks which take us 6 miles into the jungle to visit and swim in the beautiful, clear cenotes. We return to Merida in the afternoon. Day 3: Celestun National Park / Merida Celestun is home of the biggest settlement of the Pink Flamingo in the continent. To visit them, we take a boat tour and will learn about the importance of mangroves in the region. In the afternoon we will have a walking tour of El Centro of Merida to visit the Cathedral, the Casa de Montejo and the beautiful Plaza Grande. At night we watch the traditional dance of the Yucatan, the Jarana, at the spectacle La Vaqueria. Day 4: Uxmal / Calcehtok Caves We leave very early to go to the Mayan archaeological site of Uxmal, the three times built city. At Uxmal we will visit the 115 feet high Pyramid of the Magician and the impressive Governor's house, a wonder of the ancient world for its precision and architectonic beauty. Then we will head off to the marvelous caves of Calcehtok, the largest cave system of the Yucatan. We return to the hotel in the afternoon. Day 5: Tixcocob Mayan Town / Coba We will head off to the little town of Tixcocob. 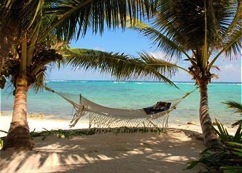 We'll learn about the art of making hammocks and will experience Mayan living first hand. After that, we head off to Coba which is among the largest of Mayan sites and offers the chance to explore unrestored antiquities set deep in tropical jungle. We'll overnight in Playa del Carmen. Day 6: Tulum / Xel-ha Today is our Caribbean experience at Tulum and Xel-Ha. 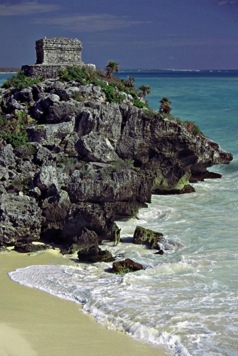 Many buildings can be explored at Tulum as well as the beauty of the rugged coast. Then, we will spend the whole day in the fantastic water theme park of Xel-Ha . We leave the park in the afternoon and will spend the night at Valladolid. Day 7: Chichen Itza We continue our journey with a visit to the famous site of Chichen Itza. It's a big place and we'll walk a lot. This important center combines majesty and nature. A step-on guide will explain the splendid Castle, an imposing example of the immense depth of the Mayas' knowledge of the cosmos, math, and science. We will visit the biggest ball game court of the Mayan world. We'll have enough time to buy some handcrafts. If time allows, we will swim in the beautiful Ik Kil cenote. We return to Merida in the afternoon. At night, we have our farewell dinner at a Mexican restaurant. Day 8: Return Home We return home very early in the morning. Adios MEXICO! Arrival into Cancun, Ouintana Roo, Mexico. We take the hotel's airport shuttle to the Marriott Courtyard which is less than 10 minutes away. 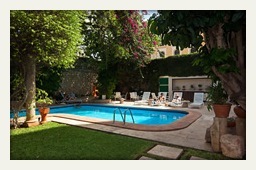 The hotel has a full range of amenities and does indeed have an outdoor courtyard with a nice big pool. 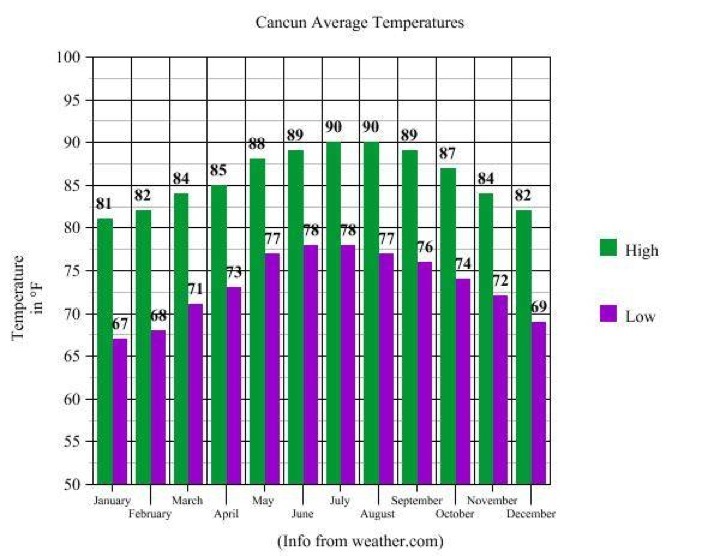 If flights arrive early enough in the day, the city of Cancun and beaches are close for independent exploring. Also, the new Maya Museum of Cancun is only about 7 miles away and is open until 7 pm. At breakfast, we have group introductions and orientation session before departing. Afterwards, we drive into the interior of the Yucatan Peninsula to tour the major archaeological site of Cobá. 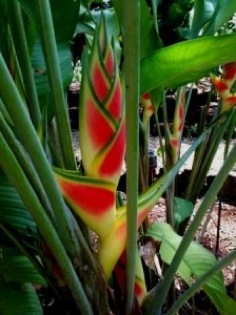 The ruins are set amidst a tropical jungle, making it excellent for wildlife viewing. Only a small portion of this mega site has been cleared. Most of its estimated 6,500 structures remain uncovered, but the ones that have been are graceful and impressive. The restored structures groupings are connected by shady, well maintained trails under the jungle canopy. 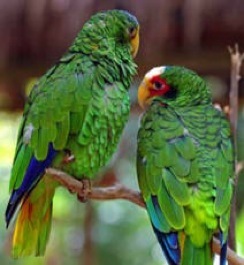 You may hear or see monkeys, a variety of birds, and forest wildlife. (There are bicycles and "taxi" bicycles available or rent for those who want an alternative to walking the lengthy jungle paths.) Built between two lakes, with most construction occurring during the Classic Period (600-900 A.D.), it was spread over 30 square miles. 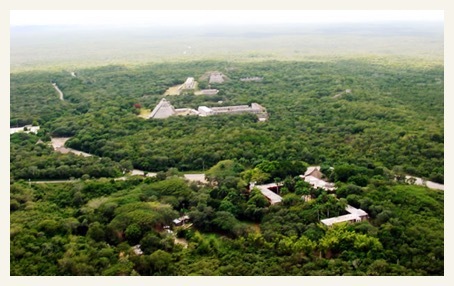 Its Nohoch Mul building at 138 feet high is the tallest pyramid on the Yucatán peninsula. 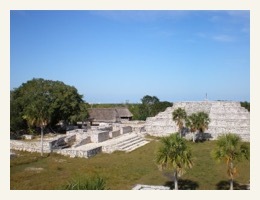 Coba is estimated to have had some 50,000 plus inhabitants during its apex in the Middle and Late Classic periods. Cobá was a hub for a system of sacbes (ancient roads), constructed by the Maya for travel, commerce, and political control. As many as fifty sacbes led into this huge Mayan city center, one of them over 62 miles long - the longest in the Mayan world. 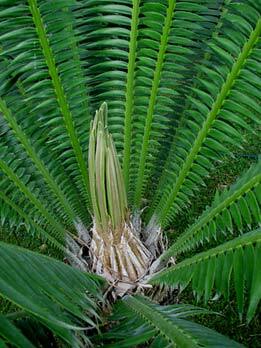 Between 10 and 30ft wide, some of the sacbes are long enough to even be seen from space. After lunch nearby, we drive into the State of Yucatán to the colonial city of Valladolid (for 3 overnights). 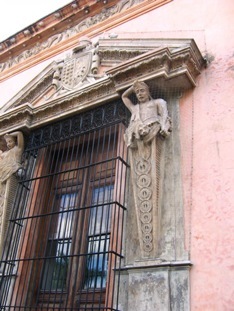 Valladolid is reminiscent of the Mérida of years ago. Founded by the Spanish in 1545, it was one of the four main Spanish towns on the Yucatán Peninsula, along with Mérida, Campeche, and Bacalar. As customary for the Spanish, the town was built on the site of an ancient Mayan city - that of Zaci, named for its cenote water source. Valladolid had a turbulent colonial history, including involvement in the War of Castes of 1847, during which the Maya of Yucatan struggled for independence from Mexico. Today it is a quaint town in which to experience traditional life in Mexico. The city centers on the zócalo, (central or main plaza), where locals and visitors congregate to mingle and relax on the benches. 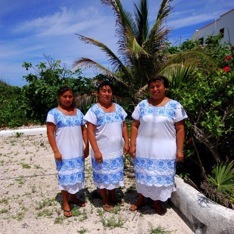 Mayan ladies in their traditional hupils (hand embroidered dresses) can be seen selling their wares around the zocalo. 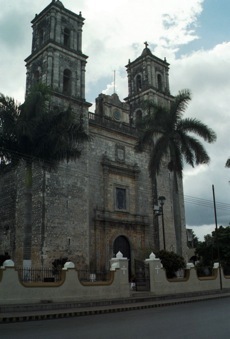 The zócalo's Cathedral is one of seven colonial churches in town. 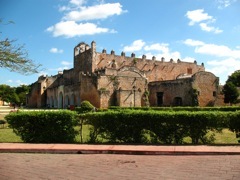 The original Cathedral of San Servacio on main plaza, took the place of the one which was erected in 1545. 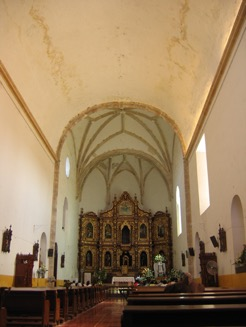 In 1705 the original church was completely demolished by order of the Bishop Don Pedro de los Reyes Ríos and in 1706 the construction of the current church began. 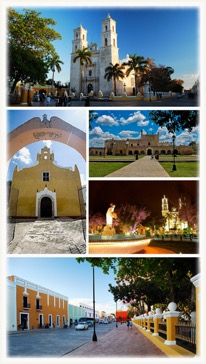 Other beautiful historic buildings include the Convent of San Bernardino de Siena, the Municipal Palace (with huge murals depicting Mexican history), the Iglesia de San Servacio, the Museum of San Roque, the Ex Telar de la Aurora, the Parque Central Francisco Cantón de Rosado, and the train station. 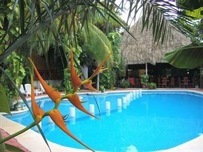 Overnights are at the lovley Ecotel Quinta Regia (www.ecotelquintaregia.com.mx). 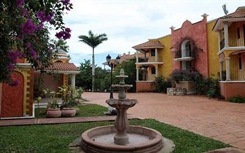 It has beautiful landscaping and is located only 5 blocks away from the Main Plaza. 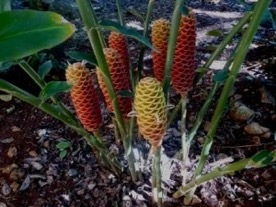 Its lush gardens feature a wide variety of local flora and medicinal plants. The hotel also has a nice pool for cooling off. After breakfast is a tour to the partially restored site of Ek Balám. 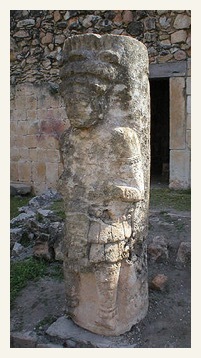 Ek Balám has one of the longest records of occupation in northern Yucatán, from about 300 BC until the Spanish Conquest. Recent excavations have uncovered some of the finest of all known Mayan sculptures. The Acropolis is the largest restored building, measuring 480 feet across, 180 feet wide and 96 feet tall. 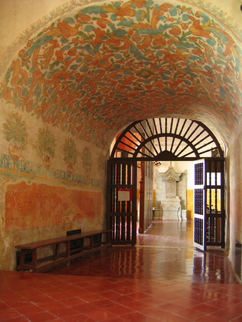 Complete with stelas, many of the buildings were built in the architectural style of Northern Petén, which included interior murals and iconography. The city's central core was enclosed with the largest defensive walls found in the Late Classic period sites. 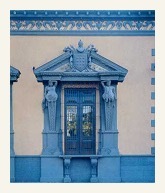 The jewel of Ek Balám's architecture is a Chenes-style, "monster-mouth" doorway atop the massive El Trono temple. The technological and artistic development shown is a sign of Ek Balam’s material and cultural wealth, manifested in the colorful and complex murals. 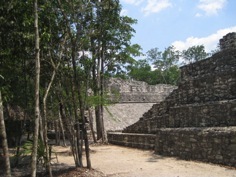 The pictorial style of Ek Balam is considered one of the best in the Mayan area. The recent archaeological project at Ek Balam, under the direction of Leticia Vargas de la Peña and Victor R. Castillo Borges of the National Institute of Anthropology and History (INAH), has made a number of discoveries in the ballcourt area, among them a painted stucco frieze and a collection of burnt stone balls that may relate to the ballgame. For those who like, while we are at Ek Balám ruins, you may also independently visit the Xcanche Cenote about 1.5km from the ruins (optional, with about $5 entrance fee). There are usually kids with bicycle taxis or you may walk. Swimming is allowed in the large cenote and they even have rappeling. Cenotes are magical, enigmatic and unique in the world and besides rain were once the only resource for fresh, sweet water in the local Yucatan jungle. They were the sacred places of the Mayas also because they represented the entrance to the underworld. The Yucatán Peninsula is a porous limestone shelf with no visible rivers; all the fresh water rivers are underground. 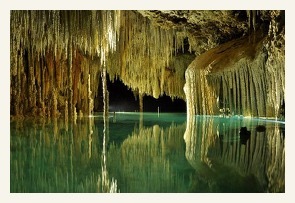 Being porous, caverns and caves formed where the fresh water collects – hence the cenotes or water sinkholes. The water that gathers in these subterranean cenotes is a crystal clear turquoise color with a very pleasant temperature of 78° F. The stalactites and stalagmites that form inside the cenotes are true natural works of art. In many, holes in the ceiling allow the sunlight to filter into the cenotes, giving the scene a magical feeling. The cenotes of Yucatán are a natural treasure that should be seen by all. For lunch after the tour, we can stop at a local restaurant in Temozón. 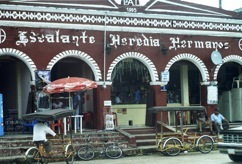 This little town is famous throughout the region for its ahumada (smoked meats), including longaniza (smoked sausage) which can be find in many restaurants in the region. Early morning tour to the famous archaeological site of Chichén Itzá to explore this incredible "Mexicanized-Maya" site. The site is overwhelming and is certainly deserving of its notoriety. The immense scale and variety of architectural styles will definitely amaze. Sitting at the edge of the Sacred Cenote and contemplating will stimulate your imagination. 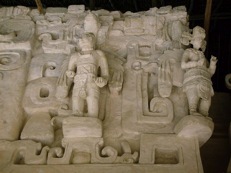 The site is the most excavated and famous of all the great Mayan cities. The ruins are divided into two areas. 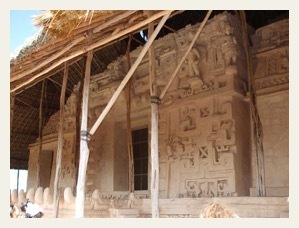 One group belongs to the classic Maya Period and was built between the 7th and 10th centuries A.D. The other group corresponds to the Maya-Toltec Period, from the later part of the 10th century to the beginning of the 13th century A.D. Containing the largest ballcourt in the Mundo Maya, the famous El Castillo, astronomical observatory, large cenotes, skull racks - it's incredible archaeology and iconography must be seen to be believed. 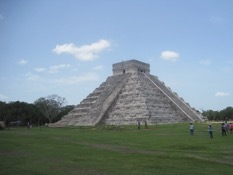 In 2007, the El Castillo (KuKulkan Pyramid) was named one of the New Seven Wonders of the World. 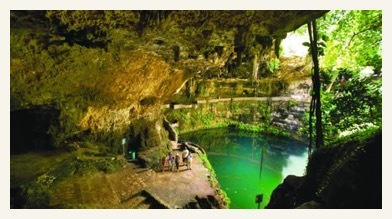 For lunch and to relax, we go to the swimmable Yokdzonot Cenote (www.yucatanmayanretreat.webs.com). About 10 minutes from the ruins, the cenote and restaurant is operated by local women starting their own ecopark. 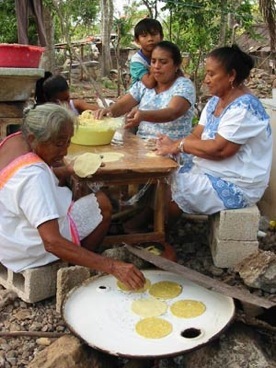 It is a good place to learn about local medicinal plants and the authentic Yucatecan meals include handmade tortillas. The cenote is far less crowded than the Ik Kil Cenote which is close to the ruins. After breakfast, upon departing Valladolid, we can make a quick stop to photograph the two scenic underground cenotes of Xkeken and Samula at Dzitnup - before the crowds that often arrive later in the day. The entrance fees are not included in case some just want to shop at the adjacent vendor stalls. was an major stop on the camino real (main road) between Mérida and Valladolid. 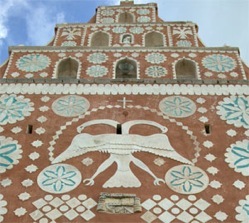 It was later "by-passed" in time and starting in 2003, repair and restorations on the church began. 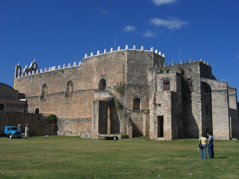 At Itzamal, we will explore the Franciscan monastery of San Antonio de Padua, whose construction started in 1533 and completed in 1561, making it one of the first monasteries in the New World. It is site of the largest atrium in the Americas and second only to the Vatican. 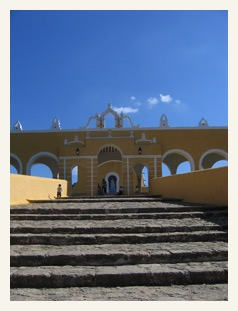 Izamal is a jewel of a colonial city, with many the historic buildings painted yellow. Cobblestone streets and colonial lampposts complete the scenery. Clean, peaceful and quaint, this is a great town to stroll through. 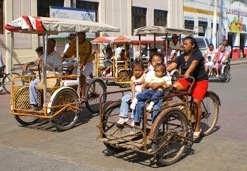 There are Mayan pyramids, colonial-style buildings, parks and plazas, horses and buggies, and lots of people-watching. Izamal is also one of the largest archaeological sites in the northern Yucatan, covering possibly 53 square kilometers of ancient monuments and residences. Raised causeways (sacbes) connected it with other important Maya centers. 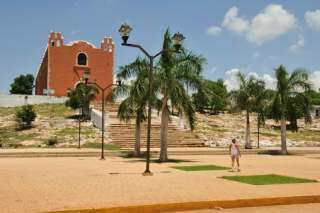 Five huge Pre-Colombian structures are still visible at Izamal. The largest pyramid is Kinich Kak Mo (Maya Sun God), with a base covering over 2 acres and rising 118 feet hight, it is the fifth largest in Mexico. Most of the ancient construction spans between the Protoclassic (200 B.C. - 200 A.D) through the Late Classic (600-800 A.D). 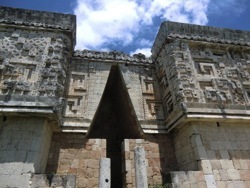 It was partially abandoned with the rise of Chichen Itza in the Terminal Classic (800-1000 A.D.). 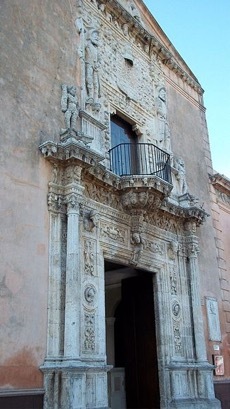 Much of the ancient stonework was later used by the Spanish for building material. Pap-Hol-Chac, the largest Mayan pyramid is now the site and source of much of the stones in the Convento de San Antonio de Padua. 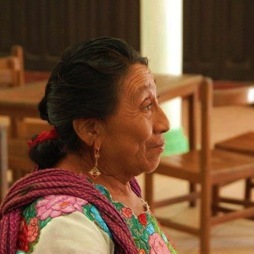 However, despite all the Spanish influences, even today it is as common to hear the Mayan language as that of Spanish in town and see signs in both languages. 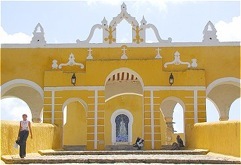 UNESCO states it this way: "Seated on the palaces that were built by the prodigious Mayans, Izamal of today is a syncretism expression of cultures that, despite the ups and downs of modernity, conserves cultural identity and the architectonic expressions of the diverse stages of its history." We have lunch at the Kinich El Sabor Restaurant. The restaurant is famous for their handmade tortillas, delicious traditional Yucatecan dishes, and palapa (thatched-covered) dining area. After lunch in this historic city, we continue on to Mérida for three overnights to explore this capital of the State of Yucatán and enjoy the city and its Sunday events. This vibrant Mexican city still retains much of its colonial charm. At one time, it was one of the richest cities in the world. It is often called the "white city" for its architecture and native dress, but as you will see, it is also a very "colorful" city; full of new sights, sounds and smells. Founded by the Spanish in 1542, Mérida was built over the ancient Maya city of Tiho. It was named Mérida because the Mayan city reminded the Conquistadors of the Roman ruins in Mérida, Spain. 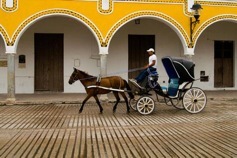 Mérida has one of the largest historic districts in the Americas (surpassed only by Mexico City and Havana). During evening strolls down peaceful streets, you can admire some of the beautiful old houses and landmarks found at every turn in downtown Merida. The historical center of Mérida is currently undergoing a renaissance as more people are moving into the old buildings and reviving their former glory. Many are now winter homes owned by foreigners as the city's popularity for a great place to live has grown internationally. Because of its tranquility and cleanliness, Mérida has also become a popular place for families from other Mexican states. Many people have moved here from Mexico City, where crime, pollution and overcrowding are evergrowing problems. 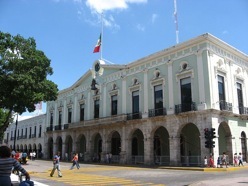 Crime is not tolerated in Mérida, and it has the distinction of the city with the lowest crime rate per capita in Mexico. 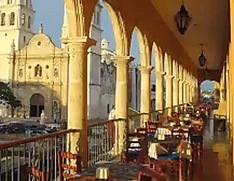 Merida also boasts a large number of restaurants for all types of cuisine, from the most basic and inexpensive to the most sophisticated fine dining. 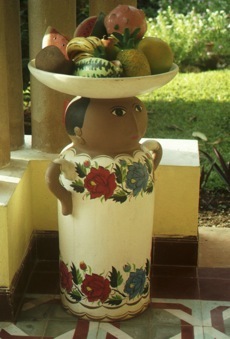 Traditional Yucatecan cookery derived from the mixing of Spanish and Maya cultures. It is the combination of recipes and ingredients from those two culinary traditions that has resulted in the characteristic flavors of Yucatecan cuisine. It also includes influences from Caribbean, European, and Middle Eastern cultures. Yucatecan food is renowned throughout Mexico for its strong condiments and the predominant use of corn. For instance, dishes like lime soup, papadzules and Motul-style eggs are all made with fried corn tortillas, and panuchos and dzotolbichay are made with corn dough. 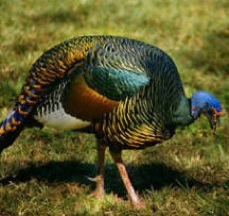 Another common ingredient in some of the most exquisite traditional Yucatecan dishes is turkey. And not to be ignored are wonderful Yucatecan desserts, most of which are prepared with locally grown fresh fruit. 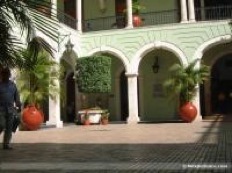 Overnights are at the colonial-style Casa del Balam, located in the heart of Merida, just a couple of blocks from the Main Plaza. 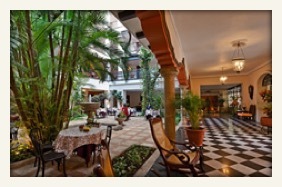 The Hotel Casa del Balam is one of the oldest and most distinguished hotels in Merida and the Yucatan Peninsula. Known as the "grandmother" of all hotels, it is also one of the few Art Deco buildings still seen in this colonial city. Marble floors, Moorish arches, and a stone carved fountain surround the beautiful central patio, making it a very special place. 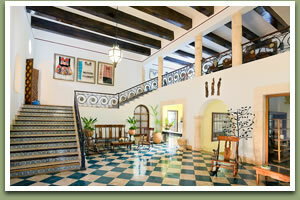 The owners love for art shows in the lobby, and antiques and pre-Columbian artifacts can be found throughout. The traditional atmosphere of the hotel radiates a home-style feeling seldom found in this now busy city. The spacious and bright rooms have central air conditioning, telephone, cable TV, soundproof windows, mini bar, and well appointed bathrooms. The hotel has free Wifi and a nice pool. when traffic is closed off around the Main Plaza. There are free outdoor concerts in various plazas and booths set up with food and crafts. You can enjoy Mérida en Domingo's outdoor handcraft markets and food festivals in the Main Plaza, Hidalgo Park, and Santa Lucia Park. 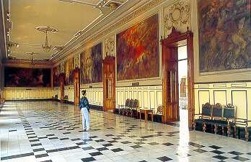 In the late morning we have a walking tour the Main Plaza or Zócalo, with such colonial buildings as the Cathedral (started in 1561) and the Governor's Palace for a historical perspective highlighted by dramatic murals and paintings. 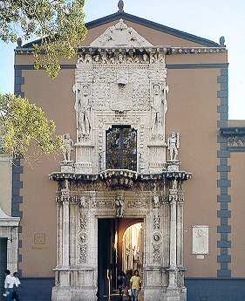 (www.granmuseodelmundomaya.com). There is an onsite restaurant for those who want to rest or have an early dinner. The expansive museum has a collection of more than 500 pieces, including textiles, religious objects, and items reflecting the current lives of the Mayas. They have engravings, books, and historical documents, artistic and religious works from the colonial historic era in addition to artifacts from the pre-Hispanic era including stelas, stone sculptures, ceramics and offerings. 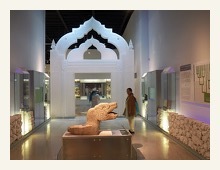 The exhibit rooms move from the present into the past through four distinct sections: The Mayab, Nature and Culture; Mayas of Today; Mayas of Yesterday; and Ancestral Mayas. r its lush greenery and refreshing cenotes. 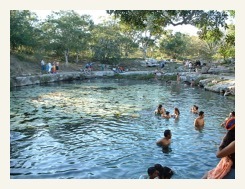 The park has over 100 natural and artificial wells, of which the Xlacah Cenote (35 meters long and 55 meters deep) is one of the most notable and unique natural setting. You may want to bring a swimsuit. One end of the cenote is very shallow, while the other is deep and continues on into a underground channel. 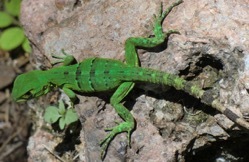 Dzibilchaltún is a National Ecological Park with hundreds of species of fauna. at one of the local restaurants specializing in fresh seafood. , white storks, and grey herons in the various roadside marshes, shallow lagoons, and estuaries. We then explore the rarely visited archaeological site Xcambo. It was an important ancient trading post for salt and salted fish production. Several artifacts have been found there as far from Guatemala and Belize. A small Catholic chapel was built right into the archaeological site using its ancient stones. 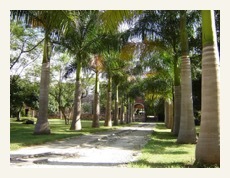 After breakfast we drive south into the Puuc region for four overnights at the lovely Hacienda Uxmal. In route we first stop at the Hacienda Yaxcopoil (www.yaxcopoil.com) to learn about sisal and henequen plantations and its import to the history of Yucatan. 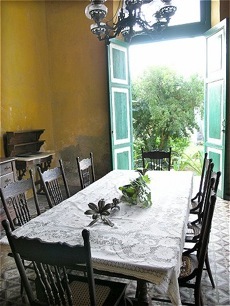 The hacienda is left much as it was in historic times, with furniture and machinery still in place. It was named for the nearby Mayan ruins and at one time covered about 22,000 acres of land, operating first as a cattle ranch and later as a henequen plantation. 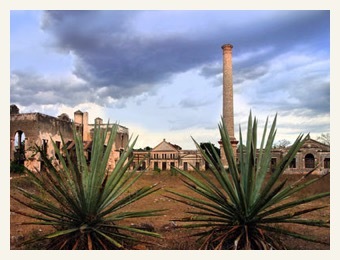 Once of of the most important haciendas in Yucatan, it has been preserved but not renovated, and now operates as a museum, and location for filming. Afterwards we have lunch nearby at another historic henequen plantation, the Hacienda Ochil (www.haciendaochil.com). 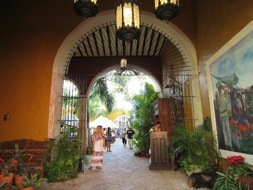 The hacienda's restaurant is popular for both its food and lovely outdoor dining settings. 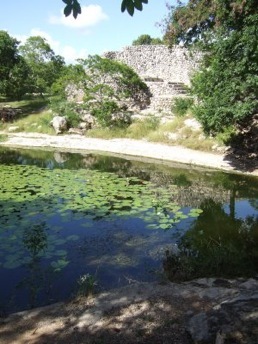 The partially restored hacienda also has a small museum with exhibits illustrating the cultivating, harvesting and processing of the henequen plant and the property even has a cenote used as an amphitheater. Continuing southward, we then tour the ruins of Oxkintok, one of the largest and longest inhabited Mayan cities in the region. The site has contributed the earliest and one of the latest dates in the Long Count calendar found in the northern Yucatan region. Recent excavations have revealed a unique mixture of of Central Mexico and early Mayan Puuc architecture styles which add to its mysterious history. Trade artifacts such as grey obsidian, jade and cinnabar from distant areas have been found onsite. 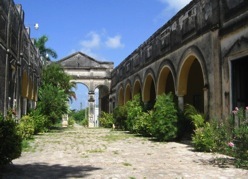 Although not often visited by tourists, the ruins are well maintained and many are partially restored. Oxkintok’s best known building is the Labyrinth or Tza Tun Tzat which you can enter. 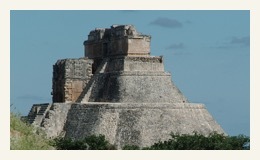 All day to tour and explore the grandiose site of Uxmal. Many consider Uxmal the most ornate and complex Mayan city yet found, you will quickly see why it is so famous as a destination. The scale of construction and the delicate carved facades are truly remarkable for any culture. Standing over 100 feet up on the Temple of the Magician, one has an excellent viewpoint of the entire site and surrounding Puuc hills. Recent excavations and restorations has brought even more of the site's grandiose structures into the light. Even before the restoration work, Uxmal was in better condition than many other Maya sites thanks to being so well constructed. Much was built with cut stones, not relying on plaster to hold the buildings together. 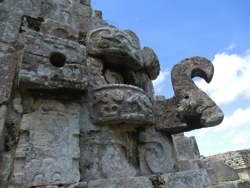 The intricate Puuc style of Maya architecture predominates. Thanks to its good state of preservation, it is one of the few Maya cities where the visitor can get a good idea of how the entire ceremonial center looked in ancient times. 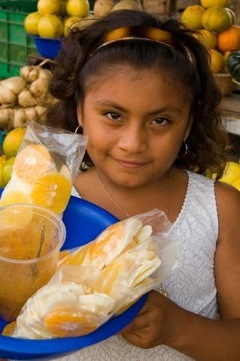 Midday, we take a drive to the quaint Mayan village of Santa Elena for lunch. After lunch, we can visit a local Maya family's compound and learn about their traditional ways of living in the Yucatan. 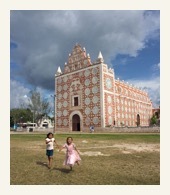 Also in Santa Elena (known as Nohcacab at the time) we can see the church where Stephens and Catherwood resided adjacent during their 1840 visit to Yucatan. 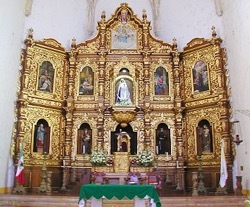 The church also contains a unique collection of portable retablos. 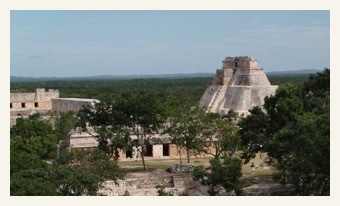 We then return to the hotel for a siesta and/or to site of Uxmal to explore missed outlying ruins. A day exploring great examples of the Puuc architectural style at the smaller archaeological sites of Kabáh, Xlapak, and Labná. The ancient Maya developed an outstanding architectural style, known as Puuc, which means “hill range” or “backbone”, after the hilly area in the southwest State of Yucatan. Vegetation in this area is low deciduous forest, animals and plants are diverse, its red soils are fertile, but there is no surface water, so the very existence of its Maya inhabitants depended on rainwater. This is why the Puuc people built numerous “chultunes” or underground cisterns which, along with natural pools, were vital to their subsistence and are still important water reserves to this day. We may have a picnic-style, boxed lunch this day as we are in remote areas. 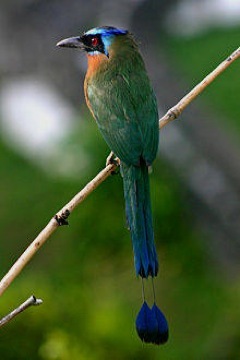 The ruins and surrounding forest also provide good birding locations. 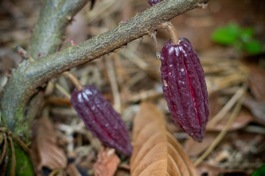 While out touring the area, we will also visit the nearby EcoMuseo of Cocao and its cocoa plantation. We can learn about the relationship of the Mayas and cocoa, the hieroglyphs for cocoa, how it was included in their paintings, how they developed it, how it was processed and used, and how it spread throughout the world via the Spanish. And, of course we can taste some chocolate and buy some! 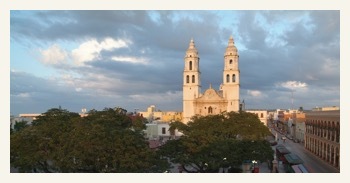 After breakfast, we depart to the coast for a day tour of the historic city of Campeche, in the State of Campeche. 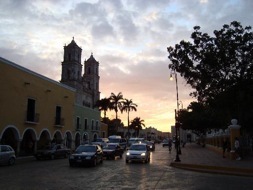 The capital, San Francisco de Campeche, during the times of the Viceroyalty was the largest port on the Yucatan Peninsula and is one of the first Spanish Colonial cites in Mexico. The export of woods was concentrated here, especially logwood or Campeche, a natural dye which was greatly demanded in Europe and America until the emergence of industrial dyes. 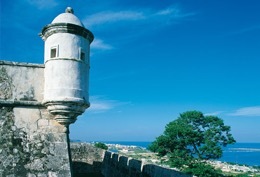 The beautiful old city is fortified and surrounded by 18th-century walls. The city, once the site of the pre-Colombian town called Kimpech (whose remains are still observable), was founded in 1540 by the son of the Spanish conquistador Francisco de Montejo. It was sacked frequently by English buccaneers, and from 1862 to 1864, French forces blockaded the city. inhabited by the Spaniards during the Colony San Francisco, located to the north of the wall, where the Mayan population was concentrated; and San Roman to the south, where the Mexican natives established themselves along with the mulattos brought from the Islands of the Caribbean, mainly from Cuba. Campeche today has many brightly colored buildings reflective of Caribbean tastes. pan de cazon (fried tortilla with shred dogfish, tomato sauce and beans), queso relleno (pepper stuffed Gouda cheese), pampano en salsa verde (pompano in green sauce) and of course, seafood cocktails, pickled fish, shrimps in many styles and fish croquettes. Today we take roads less traveled to the Caribbean Coast (now often referred to as the Mayan Riviera). 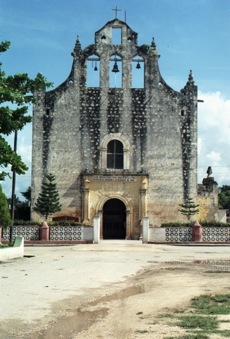 We travel into the interior of Yucatan into the State of Quintana Roo through traditional Maya villages to the historic town of Felipe Carillo Puerto for lunch and to see the Chan Santa Cruz shrine which was important to the Maya Cruzob religious movement and independence efforts. 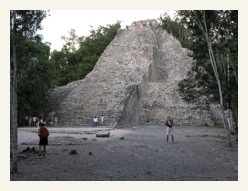 Before arriving at the seaside hotel, we stop for a tour at the famous Mayan seaport ruins of Tulúm. Ancient walls and the coast protected this Late Post Classic city which has become popular tourist attraction. We then continue on to the small seaside town of Akumal for two overnights in the Villas Maya Bungalows of the lovely Hotel Club Akumal Caribe (www.hotelakumalcaribe.com). 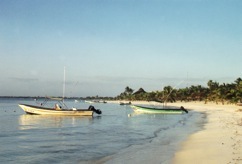 Akumal is one of the less commercialized areas of this Maya Riveria coastline. Local fishing boasts in the Akumal Bay add to the authentic setting. Akumal boasts beautiful white sand beaches and bright blue water set in a peaceful bay and the water is great for snorkeling and relaxing. 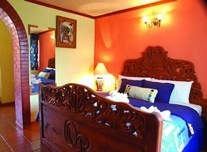 Our bungalows are, situated among lush gardens. - Sian Ka'an Biosphere Reserve (www.cesiak.org, www.siankaantours.org) Travel to Muyil for a boat ride into the Reserve and Lake Chunyaxache including a chance to get out and float in the clear waters through the grass and mangrove-lined historic canals. Volunteering vacations is a great opportunity to travel with a purpose, to feel good while sharing our time with kids or helping local institutions. 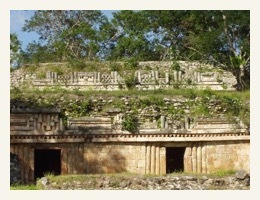 During weekends we also have fun visiting ancient wonders and natural beauties of Mexico. Lodging is in local homes. Service learning in Merida, Yucatan, is a project for student groups coming to Mexico to share their time with local kids, while doing some manual jobs and having fun. Day 1: Arrive Merida Arrival at the International Airport of Merida on Saturday. 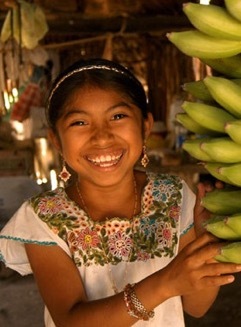 Your Adventures Mexico guide will meet and greet you along with your host family. Transfer to your home. Day 2: Uxmal / Calcehtok Caves The bus will wait us very early to go to the Mayan archaeological site of Uxmal, the "three times built city". At Uxmal we will visit the 115 feet height "Pyramid of the Magician", the impressive "Governor's house", a wonder of the ancient world for its precision and architectonic beauty. Then we will head off to the marvelous caves of Calcehtok, the biggest cave system of the Yucatan. We return to Merida in the afternoon. Day 3: Hogares juveniles / Downtown Merida Our service learning activities start today as we visit a shelter home where about 20 kids live. These kids usually have one or both parents but they don't take care of the kids. Activities could include painting, gardening, cooking, playing. In the afternoon we will have a walking tour of El Centro of Merida to visit the Cathedral, the "Casa de Montejo" and the beautiful "Plaza Grande". At night we watch the traditional music and dance spectacle of La Vaqueria. Day 4: Low income elementary school / Cuzama Cenotes Some public schools in Mexico are for students coming from families of a very low income. We will continue our service learning project spending some time with the kids and assist teachers at the class. 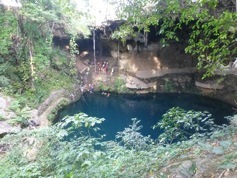 In the afternoon we visit two marvelous Cenotes located in the small village of Cuzama. The cenotes are sinkholes where underground rivers break through the limestone crust of the earth. 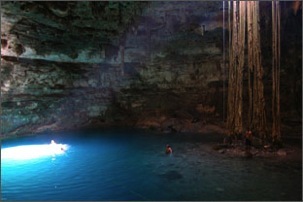 We will go into the jungle to visit and swim into the beautiful and clear cenotes. We head back to Merida in the afternoon. Day 5: Hogares juveniles / Hospital This morning we go back to Hogares Juveniles. In the afternoon a visit of a public hospital is included. As some areas of the hospital are restricted, we will only be able to spend some minutes with the kids and take them some small gifts from our hometown. The rest of the day is free with our host families. Day 6: Low income elementary school / Progreso Beach We will have a second visit to the elementary school in the morning. 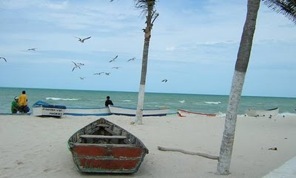 In the afternoon we will take the hot sun of the Yucatan at the beach of Progreso. 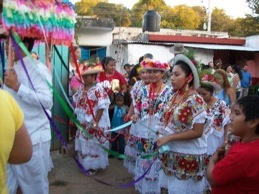 We will sing, dance and have dinner at the beach with a traditional lunada. Day 7: Tixkokob mayan village / Hogares juveniles We will have our off the beaten path excursion at the Mayan village of Tixcocob, where local artisans will teach us about the art of making hammocks. We will also have the opportunity to practice our Spanish at the panaderia , the tortilleria and the carniceria at a very traditional Mercado . In the afternoon we continue with our service learning project when we go back to Hogares Juveniles for our last activity there and to say good bye to our new friends. Day 8: Celestun National Park Celestun is home of the biggest settlement of the Pink Flamingo in the continent. 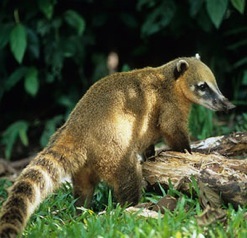 To visit them, we take a boat tour and will learn about the importance of mangroves in the region. Day 9: Chichen Itza Today we visit the famous site of Chichen Itza. It's a big place and we have to walk a lot. This important centre combines majesty and nature. 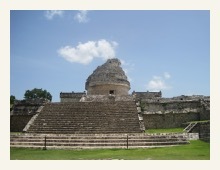 The splendid Castle is an imposing example of the immense depth of the Mayas' knowledge of the cosmos. We will visit the biggest Ball game court of the Mayan world. After the visit, we'll have enough time to buy some handcrafts. 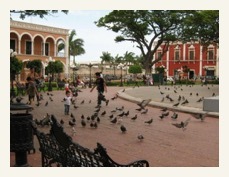 We go back to Merida in the afternoon to stay with our families. We'll have a farewell dinner at a Mexican restaurant. Day 10: Departure Our service learning project comes to an end. We will have an early transfer to the airport. Adios Mexico! Science teachers will find amazing possibilities of doing geological, biological, archaeological and agricultural educational visits with their students in the Yucatan Peninsula. Bat caves at Calcehtok, spider monkeys at Punta Laguna, Mayan history at Chichen Itza and Uxmal; watching first hand the Mexican Melipona bee and learning about the Sisal plantations. All this combined with a visit to Xel-Ha Water Park to have fun, snorkel and relax in this Yucatan science tour. Day 1: Arrival Arrival at the International Airport of Cancun in the afternoon. Meet with your Adventures Mexico guide and a transfer to your Merida hotel. This will usually be a full day of travel and we have many adventures tomorrow so a good night of rest is essential. 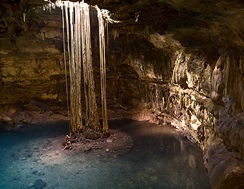 Day 2: Cuzama underground rivers Today we visit two marvellous Cenotes located in the small village of Cuzama. The cenotes are sinkholes where underground rivers break through the limestone crust of the earth. 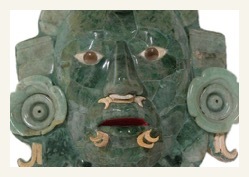 For Mayas, they represent the doorway to the spiritual underworld. After one and a half hours in our motorcoach, we get on a truck leaded by horses, which take us 5 miles into the jungle to visit and swim into the beautiful and clear cenotes. We return to the hotel in the afternoon. 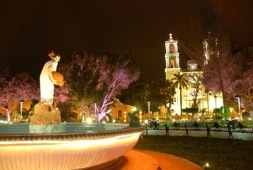 Night is free to wander the beautiful Paseo de Montejo Avenue. Day 3: Celestun / Downtown Merida Celestun is home of the biggest settlement of Pink Flamingos in the continent. To visit them, we take a boat tour leaded by a knowledgeable ornithologist who will also talk about the importance of mangroves in the region. In the afternoon we will have a walking tour of El Centro of Merida to visit the Cathedral, the Casa de Montejo and the beautiful Plaza Grande. 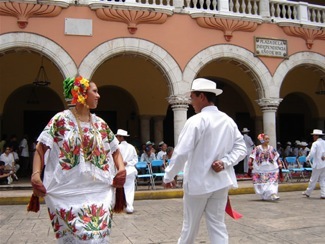 At night we watch the traditional dance of the Yucatan, the Jarana, at the spectacle La Vaqueria. We return to the hotel that evening. Day 4: Calcektok caves / Bee Colony / Plantation We'll learn today about the Melipona, a Mexican bee with no sting. When we visit the colony, a professional apiculturist will interpret all the functions that this bee has into the ecosystem. After the bee visit, we will go to a Sisal plantation to see how this fiber is cultivated and will have a traditional lunch in a local community. After lunch we go to the marvelous caves of Calcehtok, the biggest cave system of the Yucatan. 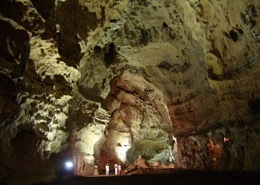 Into the caves, we'll see a vampire bat nest among the astonishing stalactites and stalagmites structures. Mr. Cuy will explain us how Mayan people used the cave as a refuge from the Spaniards during the war. We return to the hotel late afternoon. Day 5: Chichen Itza We leave Merida very early to go to Chichen Itza. It's a big place and we have to walk a lot so dress accordingly. This important centre combines majesty and nature. A guide will explain us about the splendid Castle, an imposing example of the immense depth of the Mayas' knowledge of the cosmos. 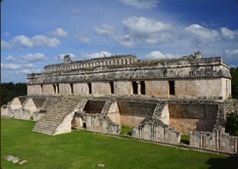 We will visit the biggest Ball game court of the Mayan world. We'll also have some time to buy souvenirs. 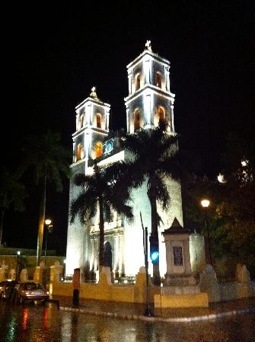 Overnight in Merida. Day 6: Tixcocob Mayan town / Punta Laguna We will head off to the town of Tixcocob. We'll learn about the art of making hammocks and will experience Mayan living first hand. After lunch, we head off to Punta Laguna Reserve where a naturalist guide will lead us into to jungle to watch and learn about the spider monkey and the diverse flora and fauna of the reserve. 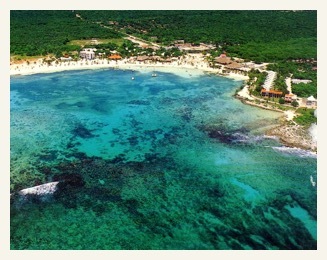 We'll have the opportunity to swim in the lagoon.We'll overnight in the small village of Tulum or Playa del Carmen. Day 7: Tulum / Xel-ha water park Today is our Caribbean experience at Tulum and Xel-Ha. After breakfast we visit Tulum, the only known ocean front Mayan archaeological site. Then we will spend most of the day in the fantastic water park of Xel-Ha. This will be an all inclusive park, so snacks, beverages and meals will be available day long. 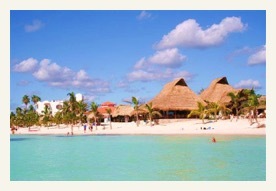 We leave the park in the afternoon and will spend the night at Tulum or Playa del Carmen. Day 8: Departure We return home very early in the morning. Adios MEXICO!